Springtime in Michigan is my favorite time of year, as the trees and gardens are bursting forth with greenery and flowers. Each day we can see changes - the red bud tree outside my studio window, the Baltimore orioles at the feeders, and the dogwood blossoms in the woods are all saying - welcome - it's time to celebrate a new season! Since the trade show took place in early March, where I released seven new designs, I've been busy charting and stitching the next set of releases. It always seems quite strange to be working on Fall and Christmas themed designs in April, May and June. But that is part of our designing cycle - a lot of time is needed before the next set of designs has been stitched, finished and put into a booklet format. 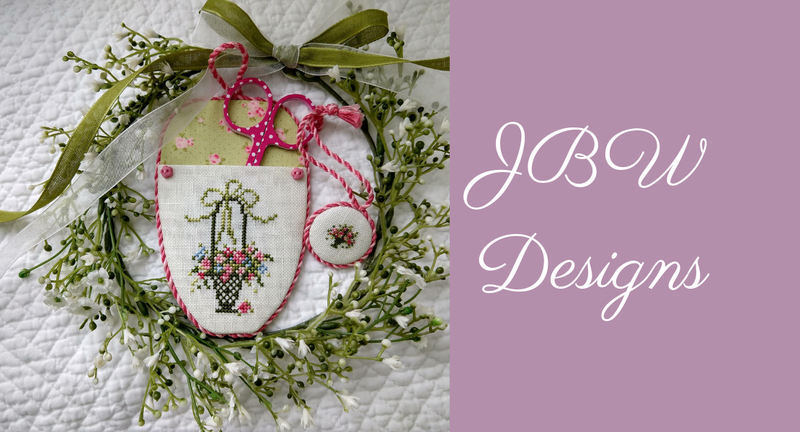 We have also opened up a new site on Facebook, called Friends of JBW Designs, and I have been thrilled with the response. I am encouraging fellow stitchers to send photos of their finished JBW projects - as one picture can inspire many new ideas. I always welcome not only new design suggestions but input on how to improve the business. Trunk shows are an important aspect of the business, and are held in shops all over the country. They are usually booked for a month, allowing one week for shipping to the shop, another few days for shipping onto the next shop or back to me, and then at least 2 - 3 weeks for the display. This month, A Stitch in Time in Jacksonville, Florida is hosting a show. Cross my Heart in Columbus, Ohio will have a show in July, and Country Cupboard in Orland Park, IL will be in August. I still have openings in each of those 3 months - June, July, and August - so encourage your local shop to book one now. It's a great way to sell and promote the merchandise -as the models and finishing are always inspiring. We are in the process of updating our blog/website so that we can update it much easier and stay in contact with our valued customers and friends. Keep coming back to see the updates and let us know how you like it.